If you are planning to purchase a narrow lot to build your dream house plan, you may want to consider a floor plan with a front entry garage. If you do not have space for a driveway to enter your home from the side, a front entry garage creates an easy entry to your house. Donald Gardner homeplans with front entry garages are designed to be aesthetically pleasing and incorporate the garage into the facade to create exceptional curb-appeal. Donald A Gardner Architects lets you purchase a full reverse of any house plan design. If you find your dream home plan and the garage is designed on the opposite side of what you need, order the full reverse product with your house plans purchase. Full reverse plans are right-reading so all the letters and number will be printed correctly on your reversed home plans. The Lucerne 1319, for example, is a small European Cottage with a front entry garage. This design offers a modest footprint and works well on center lots with a simple front entry. Rustic garage doors add charm to this welcoming home plan. 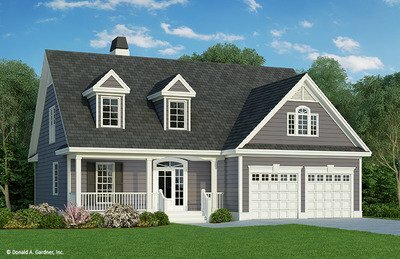 The Willamette house plan 1203 is a narrow home design with a front entry garage. This charming home features plenty of architectural elements that give it striking curb-appeal. Donald Gardner Architects has a wide range of home plans designed with a front entry garage. And if your favorite plan has a side entry garage and you need a front entry garage, our modifications department can help you make your desired changes.